A team at the Getty Research Institute has just finished cataloguing the “artist files” series of the Harald Szeemann papers. Housed in some 850 boxes, these files contain records on over 20,000 20th-century artists, from A to Z.
Harald Szeemann (1933–2005) was a visionary curator of more than 150 exhibitions from 1957 to 2005. 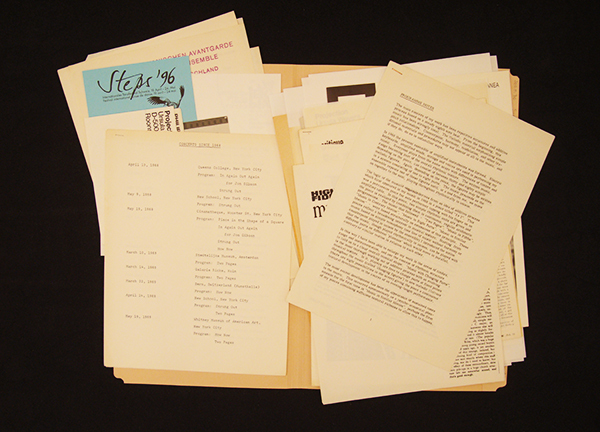 Processed with support from the National Endowment for the Humanities, the artist files—officially, Series II of the massive Harald Szeemann Archive and Library—contain folders featuring correspondence with artists, original works of art, exhibition records, and a large collection of gallery ephemera. Szeemann kept extensive records on artists with whom he collaborated, such as Joseph Beuys, James Lee Byars, Christo and Jean Claude, and Mario Merz, as well as thousands more artists from around the world. I’ve spent the last nine months at the Research Institute helping to process and catalogue these files. This sampling of what I’ve found inside, from A to (almost) Z, gives a taste of what the files contain. Vito Acconci is best known for his performances in the 1970s. In addition to numerous gallery invitations and press releases, Acconci’s artist file contains 35 black-and-white promotional photographs, each featuring images from a performance that happened between 1969 and 1971 in New York City. Each photograph has text on the reverse with succinct descriptions of his conceptual performances. 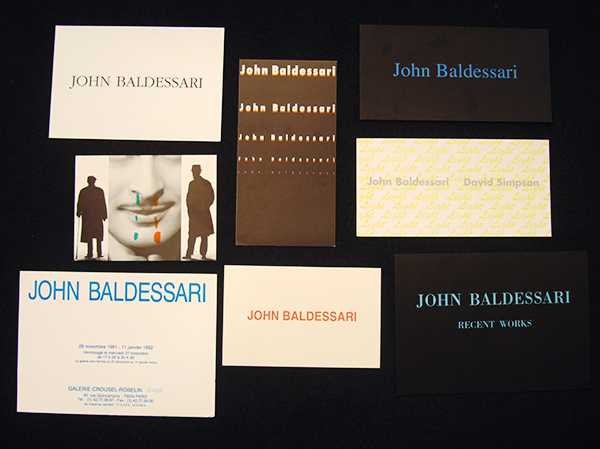 Gallery invites dominate the file for California-based conceptual artist John Baldessari, with some brief correspondence for good measure. 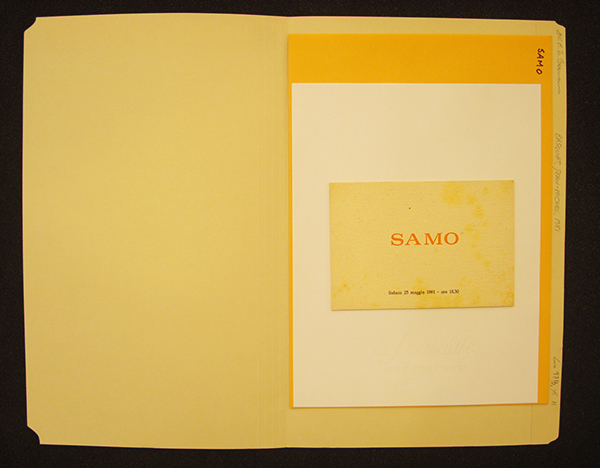 The Baldessari folder is typical of Szeemann’s artist files, providing a snapshot of an artist’s career. There are five files for Tracey Emin, all with a rich selection of correspondence. Szeemann and Emin’s letters point to a friendship of fondness and respect that began with a missed connection in 1997, the same year Emin exhibited Everyone I Have Ever Slept With 1963–1995 at Charles Saatchi‘s now infamous Sensation exhibition in London, the show that helped define the Young British Artists group. Though the vast majority of Szeemann’s artist files cover visual artists, there’s also a sprinkling of people who worked with other forms of expression, such as writers and musicians. Philip Glass’s file contains ephemera from the late 1960s and ‘70s that any fan of the pioneer and his ensemble would love to see, including an insightful statement from Glass about his dedication to creating music for the group and a complete list of early performances from 1968 to 1971. 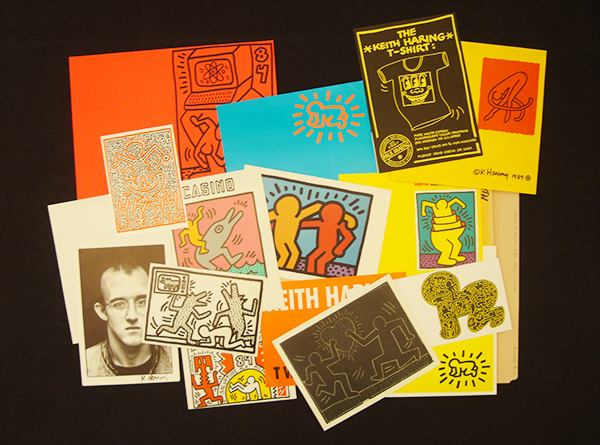 Keith Haring rose to notoriety in the 1980s for his street art and unique style. His files simply explode with refreshingly vibrant color. 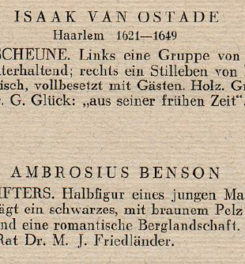 Gallery ephemera from his file begins in the 1980s and continues until 2005, the year of Szeemann’s death. I was touched to find a 1989 Christmas card Haring sent to Szeemann just two months prior to Haring’s death in February 1990. The five folders dedicated to minimalist artist and designer Donald Judd span 1967 through 2004 and feature material from around the world—a testament to the popularity of his work. Material includes writings by Judd, gallery invitations, and press releases. Ellsworth Kelly’s three files contains annotations written by Szeemann about the artist’s work, found sporadically on artist statements, as well as several curricula vitae that give a snapshot of the artist’s prolific career over three decades. The Artist Files often surprised us both by how little and by how much they include about individual artists. 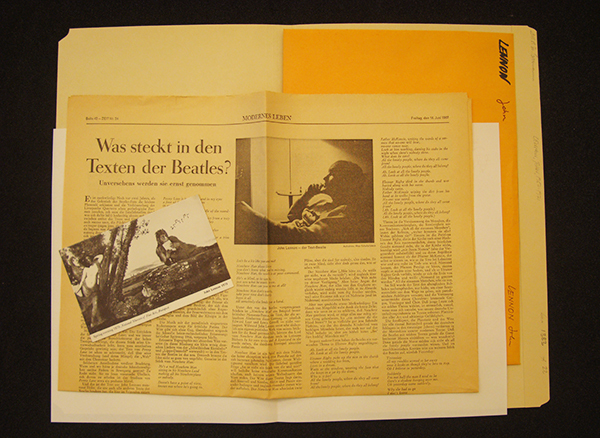 John Lennon’s folder only contains two items: a 1967 German newspaper clipping that dissects the meaning of the Beatles’ lyrics, and a 1971 postcard featuring a modified reproduction of a painting with Yoko Ono’s head pasted onto the body of a goddess and Lennon’s famous glasses drawn onto a flute-playing satyr. The bulk of material found in the Artist Files from the 1980s onwards is unsolicited gallery invitations and press releases sent to Szeemann—by then a world-famous curator—at his home in Switzerland. It’s difficult to know how interested Szeemann himself was in a particular artist’s work, but the archive acts as a unique large-scale sampling of the international art world. As an example, the file for the late Canadian photographer Arnaud Maggs contains invitations and promotional photographs sent from two different Toronto galleries. Last names beginning with the letter Q represent a rather small portion of the Artist Files, with only 63 files. 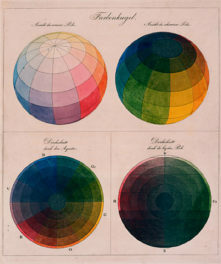 The artists found in this section are primarily Korean or Chinese, such as Shihua Qui, and point to the international reach of Szeemann’s reputation. SAMO© was a graffiti tag used by a handful of artists including Jean-Michel Basquiat and Al Diaz, that was seen in New York City from 1977 to early 1980. As Basquiat embarked on his career as a painter, he adopted the moniker and signed his early paintings as SAMO. The rare gallery invitation for Basquiat’s first one-person show, in 1981 in Modena, was found in the Artist Files under SAMO, separate from later gallery ephemera. Found in the three files for Dutch artist Herman de Vries, containing material from 1970 to 2002, is an artwork entitled “roso damascena” from 1984 that was limited to 100 copies. Once opened, the envelope reveals a plethora of dried rose buds. This isn’t an exception—the Artist files are peppered with original artworks and mail art sent to Szeemann. 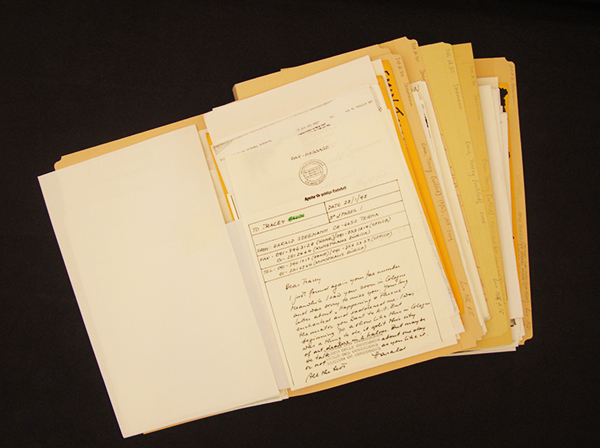 The “artist files” series of the Harald Szeemann Archive is now available to researchers. 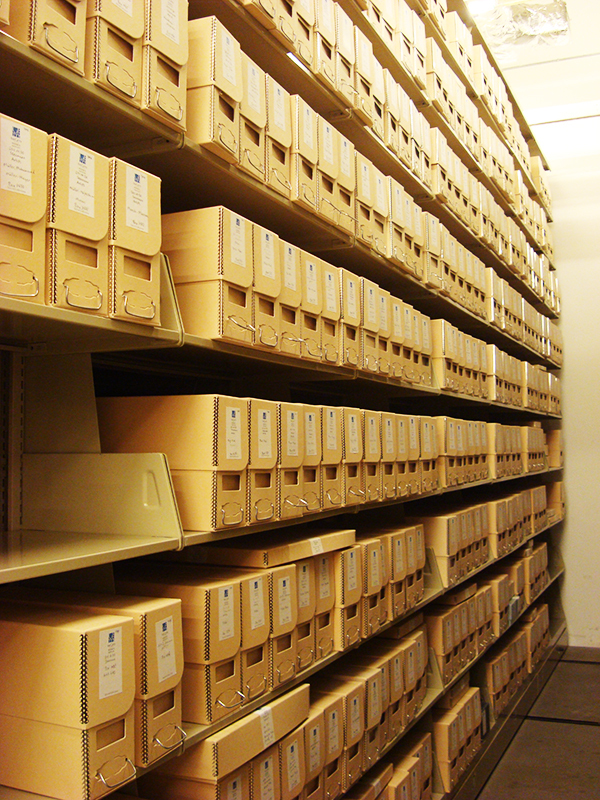 Access the newly prepared finding aid here. Read more about Szeemann and the archive here. I'm part of a small team processing the Artist files series of the Harald Szeemann Papers. I have an MA in photographic preservation and collections management from Ryerson University, Toronto. Previously, I was a graduate intern in the Department of Photographs at both the National Gallery of Art, Washington, and at the Metropolitan Museum of Art, New York. My current research interests are in the history of private photographic collections in North America.